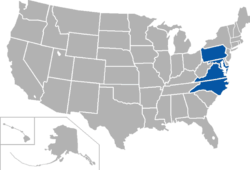 Conference members are primarily located in North Carolina (eight) and Virginia (two). There is also one school from Maryland and another from Pennsylvania. Because a majority of the members are in North Carolina, the CIAA moved its headquarters to Charlotte, North Carolina from Hampton, Virginia in August 2015. The CIAA sponsors 16 annual championships and is divided into Northern and Southern divisions in every sport except track and field, cross country, and baseball. The CIAA recently partnered with the startup network Bounce TV to televise sporting events and championships. The CIAA, founded on the campus of Hampton Institute (now Hampton University) in 1912, is the oldest African-American athletic conference in the United States. It was originally known as the Colored Intercollegiate Athletic Association and adopted its current name in December 1950. The CIAA, founded in 1912, is composed predominantly of Historically Black Colleges and Universities (HBCU) spanning the east coast from Pennsylvania to North Carolina. Chowan (CC) — Soccer (M), Soccer (W) join Conference Carolinas in 2017. Shaw (IND) — Soccer (M), Soccer (W) begin play in 2017. The CIAA is the first NCAA Division II conference to have its tournament televised as part of Championship Week on ESPN. Over 100,000 fans and spectators are in attendance annually and it has become one of the largest college basketball events in the nation. During the week of the tournament, there are many social and celebratory events to entertain the thousands of alumni, students, fans and spectators in Charlotte, North Carolina.The last day of the tournament is known as "Super Saturday" in which the men's and women's tournament champions are crowned. The tournament has a $55 million economic impact on Charlotte each year. One of the signature events of "Super Saturday" at the CIAA Basketball Tournament is the Cheer Exhibition. At the exhibition, CIAA cheer squads showcase elaborate themes and routines to entertain fans and display their talents. ↑ Burkins, Glenn (March 3, 2014). "CIAA headquarters will move to Charlotte; tournament stays 6 more years". Qcitymetro.com. Archived from the original on September 16, 2015. Retrieved August 4, 2015. ↑ "Carpenter Named New CIAA Commissioner". August 27, 2012. Retrieved August 27, 2012. ↑ "Saunders: This CIAA treasure trove fails to bring in big money at auction". February 26, 2014. Archived from the original on March 8, 2014. Retrieved February 26, 2014. ↑ "Chowan to Gain Associate Membership in Conference Carolinas for Five Sports". Chowan University Athletics. Retrieved November 12, 2015. ↑ "Shaw Athletics Announces the Addition of Men's and Women's Club Soccer". Shaw University Athletics. Retrieved June 2, 2016. ↑ "2007 CIAA Tournament Week is Largest Ever". CIAA. April 2, 2007. Retrieved August 4, 2015. ↑ Marusakjmarusak, Joe (2016-02-23). "CIAA basketball tournament declared an 'extraordinary event'". The Charlotte Observer. Retrieved 2016-09-01. ↑ "Archived copy". Archived from the original on March 4, 2016. Retrieved 2016-02-24.